The news last week of NASA's confirmation of the existence of a vast global ocean on Enceladus casts a spotlight on Saturn's icy moon as the most potentially habitable spot beyond Earth in the Solar System for life as we know it. Yesterday's news confirms much of what scientists predicted at a June 2011 meeting of the Enceladus Focus Group at the SETI Institute in Mountain View, California. We thought it would be fascinating to take a deep dive and revisit these earlier predictions. "It has liquid water, organic carbon, nitrogen [in the form of ammonia], and an energy source," said Chris McKay, an astrobiologist at NASA's Ames Research Center in Moffett Field, California. Besides Earth, he says, "there is no other environment in the Solar System where we can make all those claims." In addition, geyser-like jets spew ice crystals and gases into space, allowing a spacecraft to sample the subsurface by flying overhead. The current Cassini mission has done that several times already, but it's only equipped to find the building blocks of life, not more complex molecules. "We want biomarkers," says Larry Esposito, a planetary scientist at the University of Colorado, Boulder. Ronald Oremland, a microbiologist with the US Geological Survey in Menlo Park, California, believes an even better food source would be acetylene, which exists in comets and there are hints it might be present in the Enceladus jets and serve as a "fast food" source for microbes, Oremland says. Acetylene-eating microorganisms on Earth convert the molecule into ethanol and acetate. Their biochemistry is much simpler than that of methanogens, suggesting that acetylene might be the food of choice for the most primitive organisms. But acetylene, methane, ethanol and acetate aren't biomarkers. But if the methane coming from Enceladus is relatively rich in carbon-12, it's a strong sign of biological activity. Similarly, if the plume is emitting ethanol and acetate rich in light carbon, acetylene-eating bugs may be at work. Amino acids might also reveal life, especially if they reproduce, or reverse, Earth life's overwhelming preference for 'L' isomers over their mirror image 'D' isomers, a skew not seen in abiotic processes. Any such bias would be "persuasive evidence for a biological origin," observed McKay. Heat output from the south polar region of Saturn's moon Enceladus is far greater than was previously thought possible, according to a new analysis of data collected by NASA's Cassini spacecraft, published in the Journal of Geophysical Research. Data from Cassini's composite infrared spectrometer of Enceladus' south polar terrain, which is marked by linear fissures, indicate that the internal heat-generated power is about 15.8 gigawatts, approximately 2.6 times the power output of all the hot springs in the Yellowstone region, or comparable to 20 coal-fueled power stations. The moon's heat is more than an order of magnitude higher than scientists had anticipated, according to Carly Howett, the lead author of study, at Southwest Research Institute in Boulder, Colo., and a composite infrared spectrometer science team member. "The mechanism capable of producing the much higher observed internal power remains a mystery and challenges the currently proposed models of long-term heat production," said Howett. It has been known since 2005 that Enceladus' south polar terrain is geologically active and the activity is centered on four roughly parallel linear trenches, 130 kilometers (80 miles) long and about 2 kilometers (1 mile) wide, informally known as the "tiger stripes." Cassini also found that these fissures eject great plumes of ice particles and water vapor continually into space. These trenches have elevated temperatures due to heat leaking out of Enceladus' interior. A 2007 study predicted the internal heat of Enceladus, if principally generated by tidal forces arising from the orbital resonance between Enceladus and another moon, Dione, could be no greater than 1.1 gigawatts averaged over the long term. Heating from natural radioactivity inside Enceladus would add another 0.3 gigawatts. A possible explanation of the high heat flow observed is that Enceladus' orbital relationship to Saturn and the moon Dione changes with time, allowing periods of more intensive tidal heating, separated by more quiescent periods. This means Cassini might be lucky enough to be seeing Enceladus when it's unusually active. The new, higher heat flow determination made it even more likely that liquid water exists below Enceladus' surface, Howett noted. Recently, scientists studying ice particles ejected from the plumes discovered that some of the particles are salt-rich, and are probably frozen droplets from a saltwater ocean in contact with Enceladus' mineral-rich rocky core. The presence of a subsurface ocean, or perhaps a south polar sea between the moon's outer ice shell and its rocky interior would increase the efficiency of the tidal heating by allowing greater tidal distortions of the ice shell. 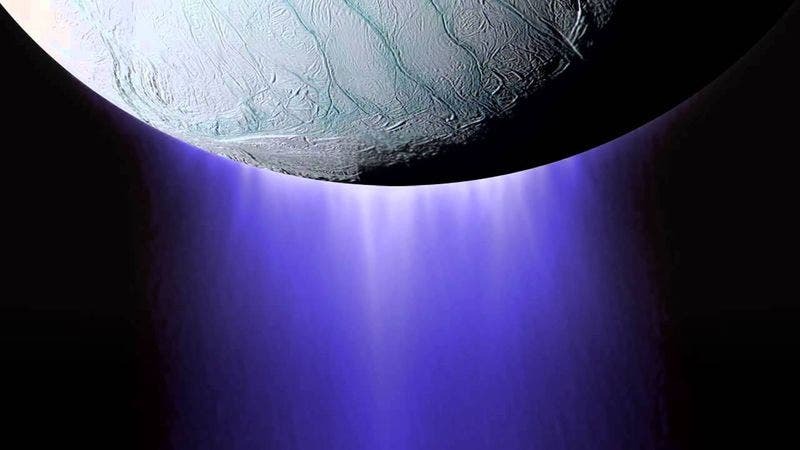 "The possibility of liquid water, a tidal energy source and the observation of organic (carbon-rich) chemicals in the plume of Enceladus make the satellite a site of strong astrobiological interest," Howett said. Carolyn Porco, director of flight operations and imaging team leader for the Cassini spacecraft in orbit around Saturn, described Cassini’s findings of elevated temperatures in the moon’s polar region, as well as an enormous plume of icy particles shooting tens of thousands of kilometers into space as "the mother lode of all discoveries." Analysis of the icy trail, which includes water vapor and trace amounts of organic materials such as methane, carbon dioxide, and propane, suggests it is fueled by geysers erupting from a pocket of salt water within the moon. On the surface, Saturn's icy moon Enceladus is one of the oddest places in our solar system to look for extraterrestrial life. Located in the frigid outer solar system, it should have frozen solid billions of years ago. Although its surface temperatures hover around 324 degrees below zero Fahrenheit, in 2005 NASA's Cassini spacecraft discovered a giant plume of water shooting up from cracks in the surface over the moon's south pole, indicating that there was a perhaps a global ocean of water beneath the ice. Analysis of the plume by Cassini revealed that the water is salty, scientists estimate from the Cassini data that the south polar heating is equivalent to a continuous release of about 13 billion watts of energy generated by radiation coupled with tidal heating. During the formation of the solar system, if Enceladus was able to gather greater amounts of rock, which contained radioactive elements, enough heat could have been temporarily generated by the decay of the radioactive elements in its interior to melt the body. But to keep Enceladus warm enough for liquid water to remain under its surface it's theorized that Enceladus' slightly oval-shaped orbit generates heat from friction deep within Enceladus, called gravitational tidal forcing. The gravitational tides also produce stress that cracks open the surface ice at the south pole, opening and closing the cracks by shearing them back and forth generating friction, which releases heat. To test the tidal heating theory, scientists with the Cassini team overlaid a map of the gravitational tidal stress on the moon's icy crust to a map of the warm zones created using Cassini's composite infrared spectrometer instrument (CIRS). "However, they don't exactly match," says Dr. Terry Hurford of NASA's Goddard Space Flight Center, Greenbelt, Md. "For example, in the fissure called the Damascus Sulcus, the area experiencing the greatest amount of shearing is about 50 kilometers (about 31 miles) from the zone of greatest heat." Hurford and his team believe that this discrepancy is caused by Enceladus' rotation rate, which wobbles slightly as it rotates. "Cassini observations have ruled out a wobble greater than about 2 degrees with respect to Enceladus' uniform rotation rate," says Hurford. The team created a computer simulation that made maps of the surface stress on Enceladus for various wobbles, and found a range where the areas of greatest stress line up better with the observed warmest zones. "Depending on whether the wobble moves with or against the movement of Saturn in Enceladus' sky, a wobble ranging from 2 degrees down to 0.75 degrees produces the best fit to the observed warmest zones," said Hurford. The wobble also generates about five times more heat in Enceladus' interior than tidal stress alone, and the extra heat makes it likely that Enceladus' ocean could be long-lived, according to Hurford. This is significant in the search for life, because life requires a stable environment to develop. "Enceladus is not completely spherical, so as it moves in its orbit, the pull of Saturn's gravity generates a net torque that forces the moon to wobble," said Hurford. Also, Enceladus' orbit is kept oval-shaped, maintaining the tidal stress, because of the gravitational tug from a neighboring larger moon Dione. Dione is farther away from Saturn than Enceladus, so it takes longer to complete its orbit. For every orbit Dione completes, Enceladus finishes two orbits, producing a regular alignment that pulls Enceladus' orbit into an oval shape. The team includes researchers from NASA Goddard, Cornell University, Ithaca, N.Y., Southwest Research Institute, Boulder, Colo., and the University of California, Santa Cruz, Calif. The research was funded by the Cassini Data Analysis Program, which includes contributions from NASA and ESA. The fastest way to get a mission there is via a gravity boost from Jupiter, which would cut the journey time from ten years to as little as seven, but the next Jupiter-assist window hits its peak in 2015-17, and then slams shut until the 2030s.